What makes your drums better than the big brands? You may have noticed that we don't offer a range of quality. There's no entry-level, no mid-level. We only have one quality level: our best. The difference is in the attention to detail, in the design and in the build -- attention and detail that mass production methods simply can't afford to provide. Carolina Drumworks drums are hand crafted through many steps and slow, careful processes. In the course of that, we do inspections, refinements, and evaluations constantly as the work is in progress. In the planning, we choose every feature to contribute to the sound, feel, and use that you are looking for. We're not limited to two or three wood species, or one bearing edge profile, or one shell construction method. In short, we don't design and build our drums to meet price points. We design them to offer the very finest performance, period. Do you have repeat customers? Yes, absolutely. 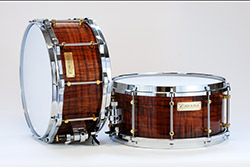 Lots of customers have purchased two or three of our snare drums, and some have as many as six. What do you need to know from me in order to build my drum? What's most helpful to us is information about how you want the drum to behave, sound, and feel. What kinds of music you'll use it for and in what kinds of venues or rooms. What your playing style is like. How you'd describe the sound you have in your head. What you like best about other drums, or what you're not getting from them. It's always good to start with a well-defined goal and then choose the best way to reach it. Do I need to provide the design specifications? No, it's actually better if we work those out together. What you need to provide is information about what characteristics you want from the drum(s) -- see the question above. Our job is to help you decide on the specifications that will create the solution to what you're looking for. Can I get my choice of hardware and finishes? Within certain limits, yes. We offer two finish options, and some choices of stains and bursts although we like to let the beauty of the wood be the star. You can select among several types of hoops and a few strainers. At the end of the build, though, the drum needs to look like part of the Carolina Drumworks family, so we won't use lugs, colors, finishes, edges, etc. that fall outside of our design parameters or our quality standards. Can you build a drum to sound like a specific recording or video? When you listen to the sound of a recording, what you hear is no longer the original sound of the drum. There are way too many variables of micing, room, gating, compression, mix, EQ, transmission, and speakers or headphones that are involved in the process. We can build to certain sound characteristics, and sometimes to match another drum, but not to match something that's been through electronic processing. The same is true when a PA system is involved -- what comes out of the speakers is not the same as the acoustic sound of that drum. Do you sell parts (shells, lugs, hoops, etc.)? Can you do repair or modification work on a drum I provide? No, sorry, we're not in the parts business, so we offer complete drums only. Same for repair and modification work -- we only handle our own brand of instruments. How much variation is there in production schedules? Hopefully not too much. In custom work, though, there may be variables in sourcing and handling raw materials, specific parts, and finishing or assembly processes. It's best to discuss projected timelines based on the design specs. If you're looking for a snare for your tour that starts in three weeks, better check the inventory list of available drums. Why aren't there more drums available in the inventory? You may find the drum of your dreams in our inventory, or you may want something similar that's a different depth, or a different wood species, or a different hardware configuration. A lot of the time it makes more sense to simply make something to fit your specific needs. So we don't pre-build too many drums, just a few that are fun to work on and we think you might like. How can I become an endorser? To tell the truth, we don't have an endorsement program. Some artists do choose to endorse our work, but there's nothing official about it -- they're just expressing their enthusiastic opinions, for which we're grateful. Instead of an endorsement program to discount our products, we simply try to make the drums as affordable as we can in the first place. Well, it's not really a factory, just a small, very specialized workshop. But if you expect to be in the Asheville, NC, area, let us know and we'll see if there's an opportunity for you to come by and bang on some drums. Will you teach me how to build drums? We're proud to mentor a few young people doing school projects, but we're not a work training facility. We like to stay focused on practicing our craft -- it's selfish, yes, but frankly we don't want to give up any part of it.